A job interview is really about a selling situation. Only, in this case, the product you are selling happens to be you. Accordingly, this advice not only helps new job applicants, but also business professionals in selling situations. I have shared this same advice, and I consistently get feedback of tremendous success. You might discover that the initial interview is conducted by someone in the human resources (HR) department. If you make it past them, then you get to step 2. If that goes well, then at step 3 you would meet the person who would be your supervisor. If you uncover that those three steps are the process, then recognize that your goal is to be interesting enough for the HR person to move you to the second step. Trying to push the HR person to make the hiring decision at this point would be counterproductive. Businesspeople often make this same mistake in sales situations. It is easy to focus on your own goal or objective. However, it is more important to understand and appreciate your client’s situation and process. Much like the HR person, the team member doing initial research about potential vendors is not likely to make a purchase decision on the spot. Similarly, your goal is establish enough interest to reach step 2. If you are the person conducting the Interview in one of the early steps, you probably have two fears: 1) You’ll overlook a good candidate; 2) You’ll recommend someone who makes you look stupid. Put another way, you don’t want your colleagues to think you are either not doing your job, or wasting their time. Remember that these concepts apply whether you are a job applicant or a sales professional. As the person being interviewed, you don’t need to ask the interviewer what worries them. That might seem strange. However, thinking about the situation from their perspective gives you an angle most will overlook. Read on to discover the sequence of questions to ask to discover what might be on their mind. These next questions will help you to stand out. The sequence is very important to follow: 1) “Can you please share with me what has made some candidates not work out so well?” Once they share some information about the failures, then ask 2) “What attributes made the successful candidates wildly successful?” Feel free to ask clarifying questions for them to share more details. The interviewer might describe reasons for failure that you recognize as your own shortcomings. They might conversely share success criteria that echo your resume. In either case, don’t be a square peg trying to fit into a round hole. Either answer is good. In a job search, your goal is to uncover the truth as quickly as possible. Specifically, your goal is to determine if there is a good fit between their needs and what you offer. Just like in a business sales situation, your goal is not necessarily to make the sale. Once they have shared enough information about the attributes of good and bad outcomes, ask 3) “Which category do you think I am in?” You’ll get to the truth very quickly. Remember, this applies to job applicants and business alike. In Same Side Selling, we describe these types of conversations as “Finding Impact Together.” When you are pushing, the natural response is resistance. But, if you get on the Same Side with your customer – in this case the interviewer – then you are working together to find a good fit. When you have a shared objective to see if there is a good fit, then both sides can work together as if you are solving a puzzle. When this happens, when the interviewer or potential customer sees a fit, they become your advocate, since you represent a good outcome for them. By focusing on the customer’s (or interviewer’s) needs and experience, you stand out above the competition. 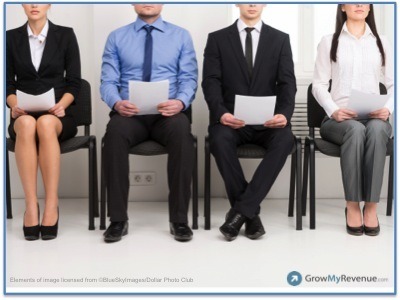 What is your favorite Interview question for job applicants? What does it help you discover? Take the discussion to Twitter and LinkedIn and share your thoughts.